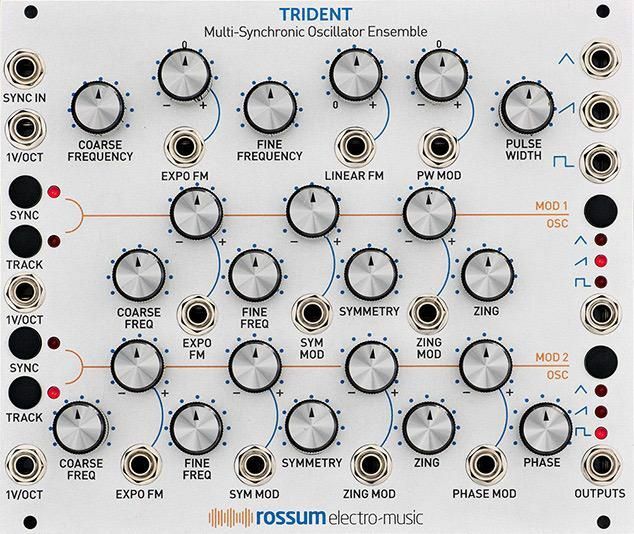 TRIDENT is a 100% analog, triple oscillator module that opens up a universe of dynamic timbral textures. 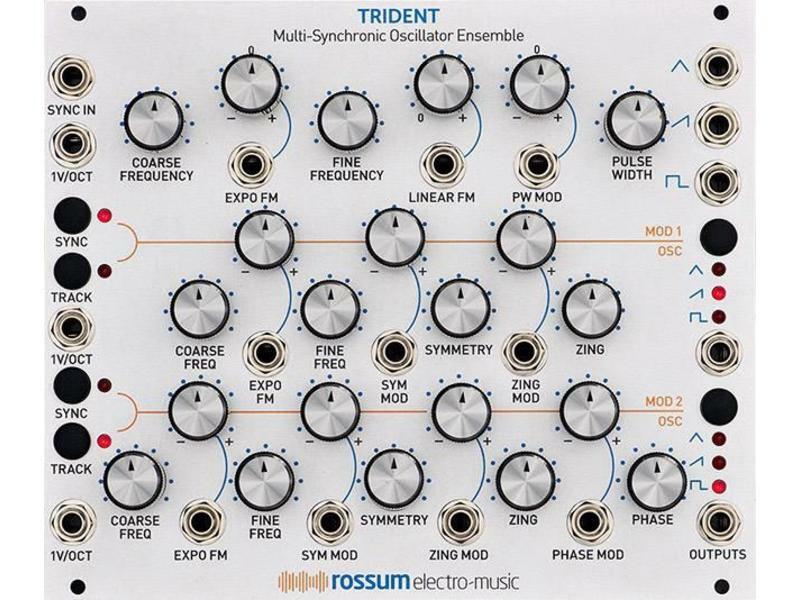 At its most basic level, TRIDENT is three precision audio VCOs, each sporting a unique variety of control voltage inputs. The main or “Carrier" oscillator provides its three waveforms simultaneously. The two Modulation Oscillators each have a single output and a waveform selector. The Modulation Oscillators also have a voltage controlled Symmetry parameter which varies the duty cycle of the triangle wave output from sawtooth to triangle back to time reversed sawtooth, and also varies the sawtooth output to have an upward or downward kink in the middle, as well as controlling pulse width when the pulse waveform is selected. And while each oscillator can be used independently if desired, it’s when they’re combined into a synchronous ensemble that the real sonic magic happens. When the modulation oscillators are set to track the carrier oscillator, the waveshape will remain constant as the carrier frequency changes. In this case the overtone structure is determined by the settings and CV modulations of the modulation oscillators. If instead the modulation oscillators do not track the carrier, some of the overtone structure will vary relative to the carrier frequency. 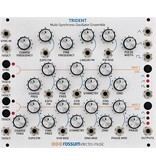 What all this means is that whether musicians take advantage of TRIDENT's unique synchronous modulation capabilities (which they, of course, should), or just treat it as three superb, wide-range analog oscillators, TRIDENT offers a vast variety of dramatic sonic textures.